N’FINITY wine cellars are a fairly new line of wine cabinets launched by Wine Enthusiast, manufacturer and retailer of small electric wine coolers, premium wine cabinets like Le Cache, Vinotheque and EuroCave, custom wine cellars and other wine accessories both through their website and catalogs. The company decided to design and manufacture a new wine cabinet line that corrects common problems (accommodating wine bottles of varying sizes, temperature requirements for storing different types of wine etc. )reported by wine cooler/wine cellar owners. That’s how N’FINITY wine cellars were born. a 340-bottle multi-temp. wine cellar. Read a review on the largest model the N’FINITY 340-bottle wine cellar with multiple temperature zones to find out about main technical features and to see whether it meets your wine storage needs and budget. The N’FINITY 340-bottle wine cellar is a double door unit with independently controlled temperature zones for setting both storage and serving temperatures for reds, whites and sparkling wines. Each side of the cabinet interior holds up to 170 bottles of wine on 15 pull-out natural hardwood shelves. The N’finity 340 is in fact two N’finity 170 models put together side by side. Each cabinet side has two temperature zones with digital controls and display. The two tinted, see-through glass doors are reversible and have stainless steel trim and curved metal handle. The doors come with built-in security lock. All N’Finity wine cellars use compressor cooling with fan air circulation. All models vent in the front allowing flexibility in placement: it can be built in kitchen cabinetry or stand it on a floor in an entertainment room or den. Temp. Set Upper Zone: Adjusts and displays, via LED, the desired temperature (°F) of the upper zone. Temp. Set Lower Zone: Adjusts and displays, via LED, the desired temperature (°F) of the lower zone. Select (upper or lower) – allows you to select to control either the upper zone or the lower zone. Note: In order to maintain optimum operation the lower compartment should be set to minimum 4 degrees higher than the upper compartment. Make sure the cabinet is properly connected to power according to the manual. Press “On” to turn on the cellar. Set the desired temp. for the upper/lower zone by pressing the + (Up) and – (Down) buttons. The upper zone can be set between 41°F to 60°F (factory preset is 41°F), while the lower zone’s temp. range is 45°F – 64°F (factory preset 45°F). If you set the Upper or Lower zone between 52°F – 64°F, the LED light next to “RED” will light up, indicating that you are within the recommended range for serving Red Wines. If you set the Upper or Lower zone between 44°F – 51°F, the LED light next to “WHITE” will light up, indicating that you are within the recommended range for serving White Wines. If you set the Upper or Lower Zone between 41°F – 43°F, the LED light next to “SPARKLING” will light up, indicating that you are within the recommended range for serving Sparkling Wines. In case of a power outage, all previous temperature settings will be automatically saved and each compartment will return to the previous temperature setting, a useful feature that many wine coolers lack. lower zone: 45°F – 64°F (7°C – 17.7°C) (+/- 2°F/). Shelving: 15 glide-out hardwood shelves with ball-bearing roller assembly, each spaced to accommodate 11 bottles of Bordeaux (standard) size and larger bottles, including Pinot Noir, Chardonnay, and Champagne. Price range: US$ 3 299 without shipping (US$ 9.7 / bottle). 30 sturdy hardwood shelves (15-15 in each compartment) that smoothly slide on ball-bearing tracks hold the wine bottles. The spacing is wide enough to fit larger size bottles (Pinot Noir, Chardonnay and Champagne). Each rolling shelf is designed to hold 11 bottles of wine (max. capacity per shelf is 55 lbs. ), and you can place 5 bottles on the cabinet floor on each cabinet side. 14 blue LED lights provide low-intensity illumination for the cabinet interior. The On/Off switch is on the control panel. The N’FINITY 340-bottle wine cellar vents in the front so it can either be used as built-in or freestanding. Make sure you place the cabinet on level, sturdy flooring in the coolest palce of your home away from direct sunlight or other heat source..
Large Wine Refrigerators – large capacity electric wine coolers, home cellars. Refrigerated Wine Cabinets – suggestions on climatized wood wine storage cabinets by various manufacturers. 100-Bottle Wine Coolers – suggestions on wine coolers with approx. 100 bottles capacity. 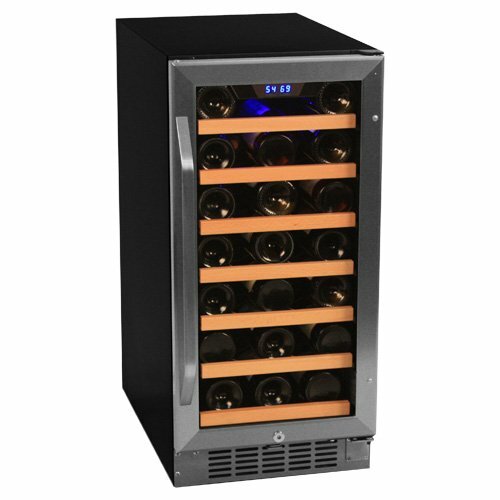 150 -160 Bottle Wine Cellars – top picks of 150+ bottle wine cooler cabinets. EuroCave Wine Cellars – the ultimate choice in home cellars. European-made wood cabinets designed for long term wine storage and aging. Le Cache Wine Cabinets – high-end wine storage cabinets with top-quality cooling system and humidity control. Various models are available including the Le Cache Contemporary Series Wine Cellars. 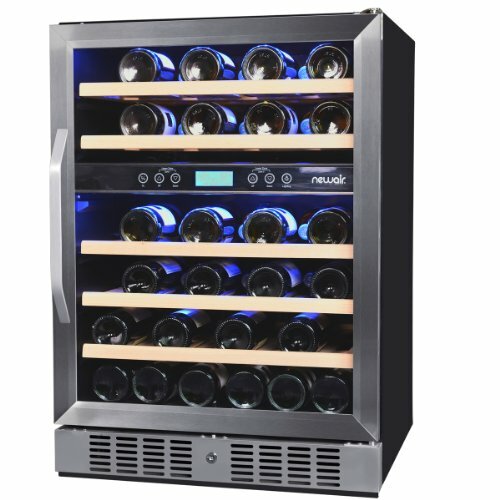 Multiple-Zone Wine Refrigerators – wine storage units with 3 or more temperature zones. 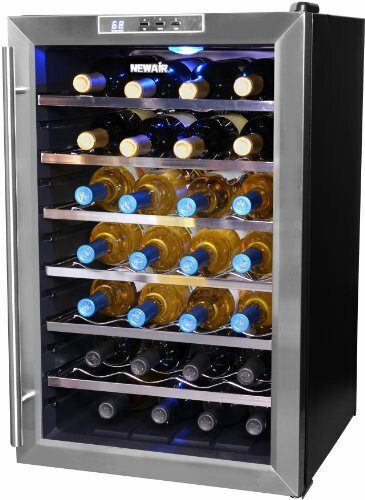 Two-Zone Wine Coolers – wine fridges with two independently controlled temperature zones. Vinotheque Wine Cabinets – hand-crafted wood wine cellars equipped with top-of-the-line climate control. Vintage Keeper Wine Cellars – offers affordable wood wine cabinets with various botle capacities: 110-bottle, 220-bottle, 250-bottle and 500-bottle. 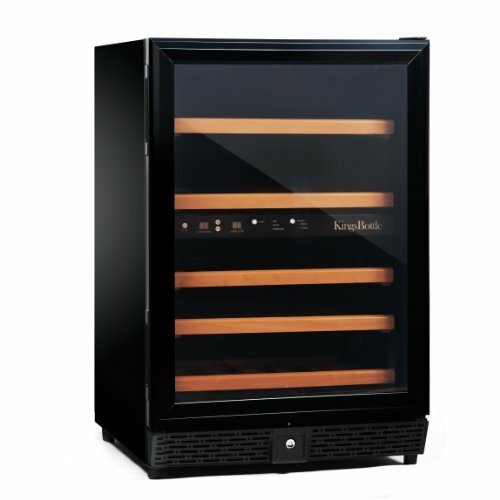 NFINITY 23-bottle Wine Cooler – a small, dual zone elelctric cellar for built-in under counter or freestanding placement. N’FINITY 50-Bottle Wine Cellar – a dual-zone unit with hardwood shelving. 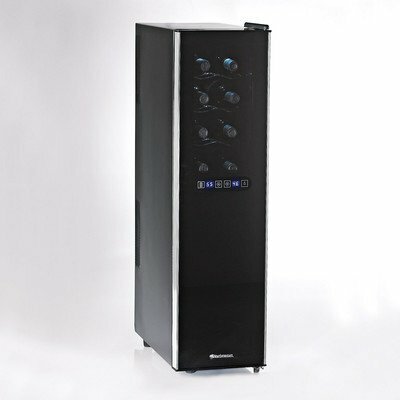 N’FINITY 121-Bottle Wine Cabinet – has the same features then the 170-Bottle model. See also our main article about Wine Enthusiast Wine Coolers. Wine Cellars for Ageing – tips on aging wine in a home cellar. Under-the-Counter Wine Coolers – 24″ wide wine cellars designed for built-in use under the kitchen counter.